June 7, 2016 ~ 5:30A 73 y.o. bicyclist Calvin Ray Sapp was killed after being struck by a hit-and-run driver in a bike lane — southbound on Higley Road midway between Ocotillo and Chandler Heights roads. A vehicle matching the description was found a short time later and a suspect was arrested. A later news story that evening said that the suspect “…told police he fell asleep and didn’t know what he hit. Officers said the bike and victim were dragged about 80 yards”. And carried some more-graphic pictures of the smashed in windshield. They also identified the Phoenix Police officer credited with finding the suspect vehicle. Note that fleeing the scene of a fatal hit-and-run crash is in-and-of itself a serious criminal felony (class 2). In the event that no grounds for homicide charges are found, the driver should, in addition to the hit-and-run, be charged with 28-672, a misdemeanor; the mechanics of this type of crash (same direction; bicyclist struck in a bike lane) indicate the driver failed to keep proper lane, he by definition moved unsafely from lane 3 into the BL, which enables a 28-672 since it resulted in death, see arizona-already-has-a-vulnerable-user-law. Higley Road in Gilbert in this area is a very wide / fast (posted 45mph) arterial street. It has three thru lanes and a BL in each direction separated by a raised median with left turn pockets. 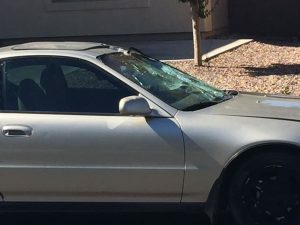 Police have located a 17-year-old driver suspected of hitting and killing a 73-year-old bicyclist in Gilbert Tuesday morning. A Phoenix police officer who lives in the area noticed a car that looked like it had just been in a wreck parked in front of a house, according to Sgt. Jesse Sanger with the Gilbert Police Department. Data reflects news accounts accurately. The name of the 17 y.o. suspect was never announced. So unknown what action, if any, was taken by police or prosecutors. As such it’s tagged with open case.